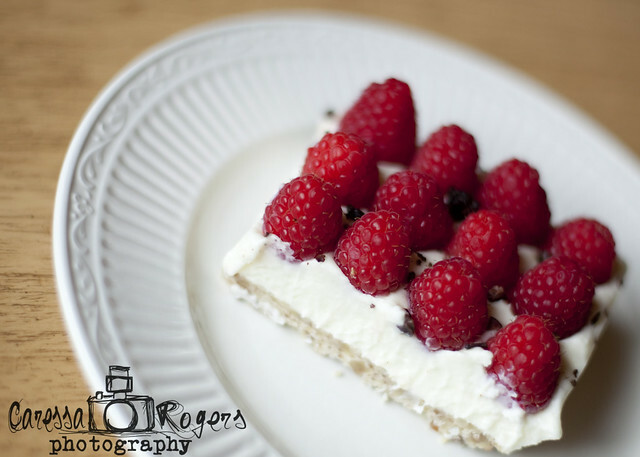 Caressa Rogers Photography: Raspberry White Chocolate Mousse Delight! Just wanted to share with you my new favorite dessert... Raspberry White Chocolate Mousse Delight! When I was visiting my parents a couple weeks ago my mom and I came up with this creation as a take off from a dessert my Daddy loved. I can't even begin to tell you know perfect it is. You will just have to try it yourself. With hands, mix all ingredients together and press into bottom of a 9 x 13 pan. In a double broiler melt the white chocolate chips and cream cheese together until smooth. Whip the heavy whipping cream and powdered sugar together. Once the chocolate/cream cheese mixture has cooled fold the whipped cream into it. Decorate the top of the mousse with raspberries. Refrigerate for several hours to allow the mousse to set up. Garnish with chocolate nibs if desired.